This chapter focuses on MR ventilation techniques as they apply to the assessment of PE, as the general subject of MR ventilation is covered in a separate chapter. Recent work has highlighted the potential of ventilation imaging with MRI using molecular oxygen and hyperpolarized 129Xe and3He. Edelman and coworkers have demonstrated the use of 100% oxygen as a T1 contrast agent for ventilation imaging in humans [41-43]. Oxygen modulates MR signal in blood and fluid by the paramagnetic properties of both deoxyhemoglobin and of molecular oxygen. Deoxyhemoglobin has the property of shortening T2* with little T1 effect. This effect is exploited in the blood oxygenation level dependent technique, which has been widely used throughout the body to evaluate local blood flow and tissue oxygenation . In ventilation imaging, however, the effect taken advantage of is the T1 shortening effect of dissolved oxygen in blood, and the spin echo sequences employed minimize any T2* effect. Figure 9 Oxygen-enhanced ventilation MRI calculated ventilation maps (A and B) following 100% O2 inhalation. lation approach clearly shows considerable potential as a complement to the perfusion and angiographic techniques already described for evaluation of patients with suspected PE. Inhaled 129Xe and 3He gases have also been employed for ventilation MRI [44-49]. These inert noble gases are hyperpolarized using optical pumping techniques, which increase their MR signal by 100,000 times compared with that in a thermal equilibrium state. 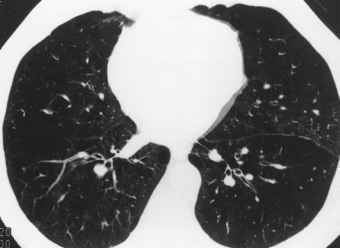 Such strong signal allows for direct data acquisition using inhaled gases themselves, thus making lung imaging of the airways possible. Excellent results have been achieved in both animal and human studies. Hyperpolarized gas MR scans can be acquired rapidly because there is no need for recovery to thermal equilibrium, and ultrafast functional MR imaging is now possible. While highly promising, these methods have some drawbacks. The administration of these gases in severely ill patients has not been evaluated for safety and the gas polarization apparatus and special MR imaging hardware are costly. The gases all differ in weight to oxygen and thus their behavior in the lungs may also differ due to gravitational effects.